At Orland Park Integrated Health, we are dedicated to helping patients recover from sports injuries, car accident injuries, workplace injuries, and neck and back pain due to spinal medical conditions like degenerative disc disease. We have successfully treated patients with herniated discs, whiplash, sciatica, headaches, soft tissue damage, muscle strains, and more. Our integrative health approach to healing focusing on holistic care, above everything else. We integrate different modalities into patient pain management treatment plans to optimize results and tailor the treatment plan to meet specific patients needs. Each modality enhances the other to maximize pain relief and accelerate the body’s natural healing process. Our treatment modalities include spinal and chiropractic adjustments, spinal decompression, massage therapy, physical therapy, acupuncture, and laser therapy. 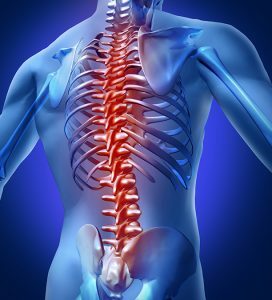 With gentle, manual chiropractic adjustments, our experienced team of Orland Park chiropractors can move the spinal discs back into its proper position. It takes the stress off of surrounding nerves and muscles. Many patients experience some level of pain relief after just one chiropractic adjustment. If the discs are compressed, we may recommend spinal decompression therapy. This type of pain relief therapy takes places on a traction table with rollers and is computer controlled. It helps increase the space between the spinal discs to eliminate irritation, as well as back and neck pain. Massage therapy is the ideal complementary therapy to chiropractic care and adjustments. It relaxes the muscles and prepares the body to accept the spinal adjustment. Plus, it increases blood supply and oxygen to the injured area for faster healing and reduces muscle spasms. Laser therapy is a good pain treatment option for soft tissue injuries. The laser’s beam is focused on the injury and penetrates the deep skin tissues to reduce pain and accelerate healing. Acupuncture entails the placement of hair-thin needles along the body’s meridian to eliminate pain. Physical therapy treatment plans are created with corrective exercises to treat specific conditions, such as osteoporosis and soft tissue injuries. It may also include ultrasound, heat/ice packs, and transcutaneous electrical nerve stimulator (TENS) units. TENs units mask back pain and can actually be used at home. Ultrasound is similar to laser therapy, but uses sound waves to deliver deep heat for pain reduction and tissue healing. Orland Park Integrated Health is your choice team of doctors in Orland Park including a chiropractor with years of experience. Turn to us for pain relief, increased mobility, and a more active lifestyle, and our pain management treatments will help to reduce the discomfort you’re in and get you back to living the healthy lifestyle you love. Before any treatment, we take a full medical history and complete a comprehensive exam, including physical and neurological, and order imaging tests for an accurate diagnosis. Once we have the exact diagnosis, we develop a pain treatment plan to fix the underlying problem. We also take the time to explain your diagnosis and are always happy to answer any of your questions or address your concerns. We’ve helped many patients live a pain-free life, and we can’t wait to help you too. Give us a call today.